The Just Right Set™ bariatric portion control porcelain dishware (with FREE Just Right Set™ Bariatric Cookbook) is the latest healthy lifestyle offering from Livliga. 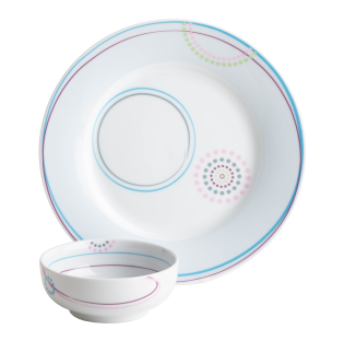 It is a beautiful 2-piece dish set that includes a bowl and a plate in the multi-colored Aveq pattern. Great to use before and after weight loss surgery or as part of any bariatric program.